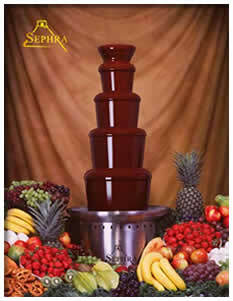 Our chocolate fountain offers a unique way to accent a party, event or dessert buffet. One machine serves 150-250 guests. Great for big parties, special celebrations, wedding anniversaries and promotions. An attendant provides service during the party, delivery, set-up, cleaning, take-down and return are all included in rental. With years of experience in the food and special events industry, you can be assured in our commitment to provide quality products and service. Fine Belgium chocolate offered in milk, dark and white. 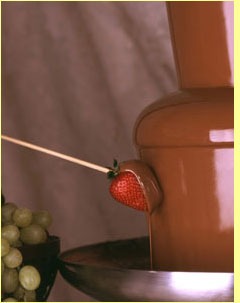 Premium quality ingredients maintain an ideal flow of chocolate on the fountain. -Convenient skewers for guests to dip into chocolate. -Variety of sweets and condiments including marshmallows, pretzels, biscotti, etc.